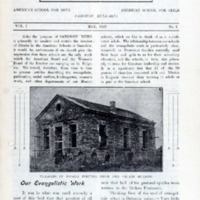 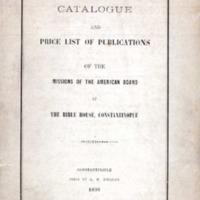 Description: Catalogue and price list of American Board publications available at the Bible House, Constantinople, 1912. 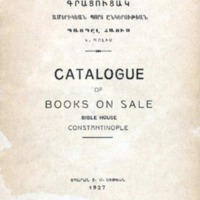 Description: Catalogue of publications available at the Bible House, Constantinople, 1927. 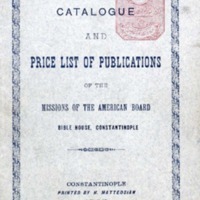 Description: Catalogue and price list of American Board publications available at the Bible House, Constantinople, 1902. 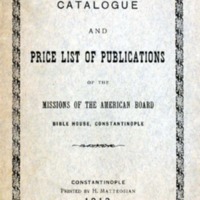 Description: Catalogue and price list of American Board publications available at the Bible House, Constantinople, 1896. 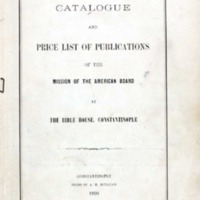 Description: Catalogue and price list of American Board publications, available at the Bible House, Constantinople, 1890. 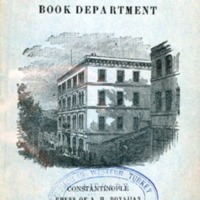 Description: Memorandum on the sale of Scriptures and Mission books, as well as the regulations of the Constantinople Book Department. 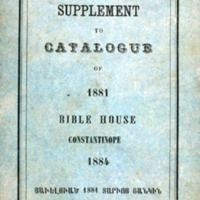 Description: 1885 catalogue of Scriptures and Mission books on sale at the Bible House, Constantinople, which supplements the catalogue of 1881. 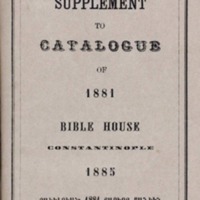 Description: 1884 catalogue of Scriptures and Mission books on sale at the Bible House, Constantinople, which supplements the catalogue of 1881. 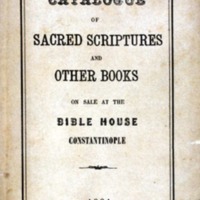 Description: Catalogue of Scriptures, as well as Mission books, sold at the Bible House, Constantinople, for the year 1881.